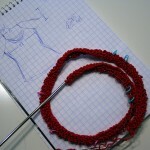 I’m sure I’m tempting fate here by planning a wool sweater for Rhinebeck, but I can’t seem to stop myself. Apparently I’m not alone. Lee Ann thinks it’s best to be safe and make both a sweater AND a tank top. Just in case. And I just might have pushed Kellee into making a sweater too. C’mon Kellee…misery is so much sweeter with company. As for my sweater, I’m still unsure about the yarn. More on that in a minute. A few of you have asked what I have planned. 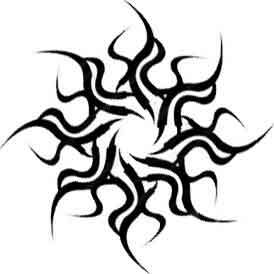 Here’s the center motif I was talking about. I played around with several tribal tattoos until I got the look I wanted. 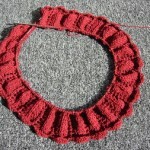 I’ve converted it to a knitting pattern with KnitPro and I started a swatch last night. So, the yarn. I revisited the balls of Whiskey that I picked up and I’ve changed my mind. It’s definitely a DK weight. I knit up a small swatch on 3.75mm needles and it was perfect. 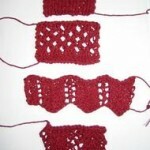 So, I’m swatching a portion of the motif to see what I think. I’m still very hung up on color though. Sometimes I think I want a neutral sweater and colorful motif (it’d be safer and I could probably wear it for many more seasons without it going out of style or my growing tired of it). Like maybe a dark gray and a black motif. Or a coppery brown with a turquoise/green motif. Other times I think, go for something like a bright pink with a black motif and make a statement. It’s at this point that I wonder if the statement I’m making is knitter trying to recapture her youth. On a positive note, my travelling companions wouldn’t ever be concerned about losing track of where I was. On a negative note, with that sweater on they may just want to ditch me. Maybe not though, since I will be the one driving. So what’re your thoughts? Neutral and safe? Bright and bold? Oh, and to add to the mess, I think I’m dyeing my hair a dark black cherry for the fall. So it all needs to coordinate. As far as color for the background, look through your closet and see what colors you wear the most and get something that looks nice with (ie a ton of black pants). You will wear the sweater more and it will go with lots of things you already have. The last comment is kind of right. But personally I am not a fan of duplicate stitch? 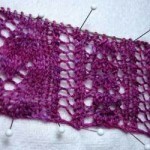 I would do Intarsia and go for colours you’ll still like in 2 or 3 years. I don’t really have any thoughts on the the rights colors, but I love the motif! why not go in the middle? Knit the sweater in a dark dark gray, and the motif in a dark cherry to match the hair. So it’s muted, but not all drab gray/tan. Not that gray and tans are bad mind you, very good for wearing to work.. but you can be more subdued but still spunky.. with the right dark/artsy color-way! hhmmm, i’m kinda keen on the black and dark grey idea. Who says the only choices are neutrals or bolds? Personally, I’d go for subdued kinds of colors, but in an unexpected combination. Purple and green. Blue and gold. But in toned-down kinds of colors, you know? I like the neutral w/color motif…. I personally would go with the black and pink — but that’s my own personal style. If I didn’t have any self control I’d knit everything in black and hot pink. That said, look into your wardrobe and figure out what you don’t already have (do you need more neutrals?) and what you’re likely to wear. Either way, it’s going to be gorgeous. Oooh, black cherry hair would be good. You can make a sweater in time! I believe you can do it! You know that I think you are adorable- hair, style, whatever. I am sure the new hair will be fab. If you start and finish a sweater between now and Rhinebeck AND wear it to the fest (weather permitting), I pledge to treat you to enough sock yarn for one pair– your choice– at the fest. Just a little incentive for you, my fickle friend! I vote for bright and bold. AND, you’ve inspired me: I was thinking last night, “I could frog the ill-knit Boogie vest (it’s wider than it is long… OY), reknit it, either reusing the yarn, or trying something new, AND wear it to Rhinebeck.” Granted, it’s just a vest, but it’s a hand-knit item nonetheless! You finish and wear that sweater, girl, and there’re a couple of rounds of margaritas/pick-your-fancy on me. I ADORE that motif! It’s fantastic! As for color choices, I have to say that I would hesitate to try to match hot pink with black cherry hair. I suspect that in the end you’d never wear it out of the house, and where’s the fun in that? Do go for color though. Like, say….turquoise sweater with burgandy or even hot pink motif. Or caramel brown tweed sweater with electric blue motif? That would be especially stunning with the black cherry hair, but brown might equal boring for you. Of course, there’s always bright red for the sweater with some sort of lurex/sparkly silver or gold yarn for the motif, but that may be taking it a bit too far. But then, there will also be at least one, if not two, finished shawls as well, I hope, so that’s got to count for something, eh? I say if you are going with dark cherry for the hair, go with the bright pink to match/contrast! Woo! It hits me as a natural organic tweedy light neutral colored sweater. Something the color of Big Sky Alpaca’s undyed natural cotton. And the motif done in some kind of organic hued rainbow going from red at the tips to a purple/violet in the center. 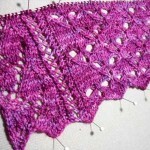 I think it would be best done in intarsia, working with 1 yard lengths of wool for the color, Kaffe-Fasset-style. Neutral, that way you can dye your hair whatever color you wish! I prefer intarsia over duplicate stitches, but that’s just because I’m not very good with tension. I think a grey sweater with black motif would be simple yet stunning. Although, neutrals would be pretty too. like a cream sweater with light tan motif…it would look kind of yoga-y (in a good way!) So, yeah, I vote neutrals or grey and black. The pattern is already visually stunning enough that you don’t need bright colors in my humble opinion. I think black with a pink motif would be great. Go look at the Cheesy Love sweater in the Knitty archives for what I mean. I would do a more vibrant pink though. You could always duplicate stich over the motif in a few years with a new color. That will be awesome! I would go neutral and safe. It will still be really cool, but you will be able to wear it more often.